Update: One thing I wanted to point out… a lot of people seem to be under the impression that I cook all of my meat ahead of time and then thaw it so I’m losing a lot with the quality of the meat. That is not the case and I’ll go read the rest of the post to see if I led you to believe that anywhere. The only meat I do cook ahead of time, is the shredded chicken, ground beef and taco. Everything else, gets frozen uncooked. I actually mention that this way it gets to marinate while it’s thawing and THEN we put it on the grill to cook. I’ve been doing freezer meals for a couple years now, and admit that like most things in my life, I could stand to be a little more consistent with this! I probably have a “cooking day” about 3 times a year and those meals will tide us over for a couple months. Have you ever heard the story about the boy who woke up on a gorgeous day and his dad told him he had to go out back and chop firewood. The boy asked why he had to spend a warm, summer day chopping firewood and the dad said it was so he didn’t have to do it on a cold, winter day. That’s how I feel about freezer meals. It’s all about sucking it up and committing to an afternoon of slaving away in the kitchen, because you know it will make life SO much easier for the next couple months. This way, when you have that warm, summer day when you’re running your kids here and there and life seems so chaotic… dinner is already made and you look like supermom for doing it all and still putting a healthy dinner on the table! First thing I do is look for sales! When I know I’m running low on meals and I see bags of onions are buy 1 get 1 free… well, that’s all the signs I need to get going! Before I even get to the meat, I finely chop both bags of onions and 6 green peppers and finely grate a bag of carrots. Just keep these all in separate bowls and they’re all ready to go for whatever recipe you’re working on! Are you seeing these prices??? $17 worth of sirloin for $6.50! A $13 pork loin roast for $4! I split that in half and got 2 meals out of it (which will each have leftovers!)! So that’s $2/meal for a family of 4! And that 92% fat-free ground beef… oh yeah, I got 8 packs of that! I also found boneless, skinless chicken breasts for 79 cents/lb., plus chicken breast w/ bone-in for $1/lb. I seriously cleaned up in the meat aisle. Ask your butcher at your local store what day they mark the meat down. Mine marks it down on Wed. mornings and there are always deals to be found! Anyways… while your potatoes are cooking, plop about 2 lbs. of ground beef and a bunch of onions, green peppers and carrots into a cast iron skillet and let it do it’s magic. (side note, I throw grated carrots into A LOT. The kids don’t know they’re eating it, it bulks up your meal for little cost and why not??). Once this is all cooked and cooled, divide into quart size freezer bags. You’ll be so glad to have these on hand! Pull out to add to spaghetti sauce, sloppy joes, nachos for unexpected company… the list is endless! After that’s done, in the same pan, cook up another 2 lbs. of ground beef, 2 cups of salsa, a can of diced jalapeno peppers, 2 tsbp. chili powder, 2 tsp. garlic powder, 2 tsp. onion powder, 1.5 cups of water, cumin, some brown sugar, garlic, a bunch of diced onions and whatever else you like to add to your taco meat! While all the above is cooking, you can get lots of other meals made! When I’m mixing up a marinade for meat, I mix it right in the gallon ziploc bag. Don’t dirty all those bowls if there’s no need for it! Take it from this clumsy girl, don’t leave a bag filled with an oily marinade just sitting on the counter. What’s my method, you ask?? I take the bottom out of my blender (please remove that blade!!) and then just put my freezer bag in and wrap the top of the bag down the sides to hold it in place. Pour in your marinade ingredients and you can mix it right up! One of my favorite (quick!) 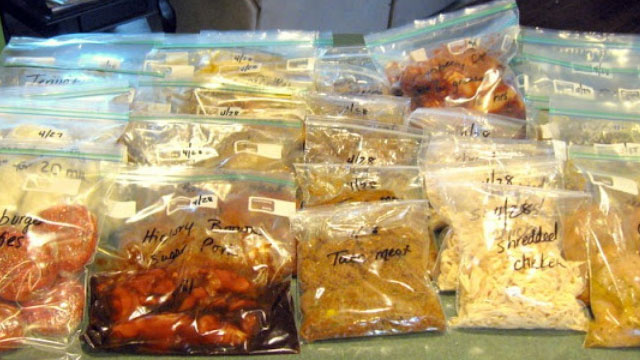 ways to get a lot of meals done in a short amount of time, is to make a big batch of one marinade and then use it on different types of meat. It doesn’t seem like you’re having the same meal over and over then! We love a teriyaki marinade! I use 2 cups of soy sauce, 1.5 cups of sugar (it calls for 2 cups, but I decrease it), 1 cup of Mirin (rice cooking wine), A LOT of fresh garlic, salt & pepper. Use about 1/2 cup of the marinade for every lb. of meat. So you mix up this one batch of marinade and BAM… you just got yourself about 8 meals! I use it on steaks, chicken, pork chops, tuna steaks and shrimp. During all this, throw a bunch of chicken (I use bone-in chicken for this), in a stock pot with water, a lot of chopped carrots, celery, onions and any spices you like. I simmer it, covered for about an hour or until the chicken is cooked. Pull your chicken out, throw away the veggies and let the broth cool. Once the broth is cool, freeze it for chicken stock for other meals. Shred your chicken and you end up with a mountain o’ goodness. Split this up between quart size baggies and freeze. Use for chicken salad, tacos, enchiladas, wraps, etc. I already promised my son we can use one bag for buffalo chicken salads- after it thaws I’ll just throw it in a frying pan with a little butter and hot wing sauce for a couple minutes until it’s heated through and I will officially be his favorite mommy for the day! You could also make BBQ chicken salads. You can never have enough shredded chicken for summer meals! Once your potatoes are done cooking and cooled enough to handle. Just slice them right down the middle and make some double-stuffed potatoes! Scoop the insides out into a bowl and add some butter, softened cream cheese, milk, chives and whatever else you like. Sometimes we add crumpled bacon, shredded cheese, ranch dressing… whatever we’re in the mood for. Use a potato masher until it’s all mixed in and then spoon the filling into your potato shells. I wrap these individually in plastic wrap and then put in a bag. On serving day you thaw and then bake in a 350 degree oven for 20 minutes or until heated through. Summer freezer cooking is SO much easier than doing it for the colder months! It’s basically just a bunch of marinades and then you grill everything! If you aren’t feeling up to making your own marinades, you can still buy a bulk package of meat, split it up between freezer bags and just add some pre-bottled marinades! It’s still cheaper, your meal is prepared ahead of time and letting the meat marinate as it thaws will make it much more tender and flavorful! My all-time favorite resource for freezer meal recipes is the book “Don’t Panic, Dinner’s in the Freezer!”. I’ve been using it for about 2 years now and every recipe has been a hit! Last year I bought their 2nd book and we haven’t tested as many of those recipes yet, but it’s also fantastic! One of my favorite parts of these cookbooks is they do all the conversions for you if you want to triple, x6 or x9 your recipes. This is fantastic, if you have a favorite recipe and want to triple it for 3 different kinds of meats! If I have leftover carrots or onions when I’m done, I just freeze them in 1/2 cup increments and pull them out whenever I need them! I didn’t get to it today, but I often will make huge batches of 40 or so waffles and freeze them so the kids can pull them out on a weekday morning! All ends from the bread loaf get frozen for bread crumbs. And I live by Chocolate World, so if I have time, I’ll stop in and buy their bags of day old cookies cheap and then freeze them for cheesecake crusts or crumb coatings. I also try to always have some cooked sausage (w/peppers, onions and carrots) frozen that can be pulled out on the weekend for omelets or a quiche. If I’m making casseroles or meatloaf, I line the pan with plastic wrap and then fill the pan. Put the whole thing in the freezer and once it’s frozen solid, pop the plastic wrapped food out of the pan, put it in a freezer bag and now you still have your pan to use in the meantime. Just remember, when it’s time to use it, take the plastic wrap off while it’s still a frozen block and put it back in the pan to thaw! I also found some other deals that I won’t even do anything with until it’s serving day! Most of these things are normally $4.95/pack. I got them for 50 cents to $1/pack! What’s that you say??? AWESOME!! Not including these “ready-to-go” meats up above, I prepared 46 meal starters for us for the summer! We have leftovers from nearly every meal, so this will actually get us much more than just the 46 meals. Add in these prepared meats above, the nights we’re away, cook-outs, etc… and I don’t really have to cook until about Sept.! And trust me, the hubster loves this too! If he gets home before me, dinner is thawing in the fridge with directions right on the bag. He plops it on the grill, throws the bag away and dinner is served with no mess to clean up afterwards! I kept track of how much I spent on meat and veggies and just added extra money in for all the staples I used and I’m roughly guessing I spent about $95 on these 46 meals. That’s just over $2 per meal for our family of 4! I’ll take it! Edited to Add: I did a follow-up post to this one where I tried to answer most of your questions! Please check out that post and this one and hopefully that helps! I’m still getting lots and lots of emails asking for all my recipes, and I’m REALLY sorry, but I’m not going to be posting them! The reason is that they aren’t my recipes! I take them from Don’t Panic- Dinner’s in the Freezer and I just don’t think it would be fair to those authors if I copied their recipes word for word here! Sorry, but the book is only $8 on Amazon! For anyone interested in buying the books I mentioned, I wouldn’t be opposed to you clicking directly on the links below! : ) Thanks!